This is an easy way for most of us to visualize fractions. We are used to cutting up pizza or pumpkin pie into various-sized slices, depending on the number of people we are serving. And because children like pizza, this makes fractions seem less threatening. Area/volume fractions come in other shapes than the ubiquitous round food. My children’s first experiences with fractions came in deciding how they wanted their grilled cheese sandwiches cut. And as we will see (in my Understanding Math blog post series), a pan of brownies is useful to explain fraction multiplication. Just as the number line is our most useful model for understanding numbers in general, so the bar (which is a thickened portion of the number line) will be our most flexible model for understanding and using fractions. Cut the bar vertically, like the marks on a ruler. Bars of the same length can be cut into different-sized pieces and laid beside each other, making it easy to compare an assortment of fractions. One of my favorite projects is to have students make a fraction-strips poster using adding machine tape for the strips and a colorful posterboard backing, similar to this “Fraction City” activity. This is the least natural way for me to understand fractions. If these fractions seem awkward to you, keep coming back to them until they make sense. “Parts of a group” are important in understanding later topics like percents and probability. The denominator is how many are in the whole set, and the numerator is the number of individuals you are talking about: “Three out of five dentists surveyed…” is the fraction 3/5. If I have six apples, but two of them have gone bad, then 4/6 of my apples are still edible. Have your elementary students make Fraction Cards. You will need 3” x 5” index cards, cut in half, or a stack of old business cards with blank backs. On each card, either write a fraction or draw its picture. Make sure that each book of fraction cards contains all three of the fraction pictures plus a card for the fraction itself. For example, one card may say “1/2.” It would match a picture of a circle with a line across the middle and one half colored in, and a bar diagram with one half colored, and a group of two apples (small circles) with one colored. A card that said “2/2” would match a circle with a line across the middle and both halves colored in, a bar cut in half and all colored, and a group of two apples that are both colored. You may want to add fifths and tenths, but this makes a huge deck that I find unwieldy. When children understand the simpler fractions, they can apply that knowledge to any fraction they meet. When you think the deck is finished, lay the cards out on the table in books, to make sure each card has all its mates. Every book should have one fraction card and three picture cards. Use the fraction cards to play Concentration: Lay them all face down on the table, then try to turn up two matching cards — any two cards that belong to the same book of fractions. Or play Go Fish, according to your family’s favorite rules. Both of these games help children become familiar and comfortable with fraction models. Identify and understand fractions in a variety of real-life contexts. Add and subtract fractions within the same fraction family (same denominator). Compare fractions within the same family and tell which names the greater amount of stuff. Compare fractions with the same numerator (but different denominators) and tell which names the greater amount. When given a fraction less than one, tell how much more it needs to make a whole unit. Change a mixed number into an improper fraction by mentally cutting apart the whole units. Change an improper fraction to a whole or mixed number by grouping the pieces into whole units. Add and subtract mixed numbers within the same fraction family (same denominator). Depending on your curriculum, this should bring your students to the middle or end of 3rd grade with a solid understanding of fraction basics. Ideally, they should work enough problems of the types above to make their calculations nearly automatic before going on to the next big idea. Next time: Equivalent fractions, or how to work with fraction families. This is post #4 in the Fraction Basics Series. It is featured in the 147th Carnival of Education: The Noble Prizes and in Carnival of Homeschooling #101. 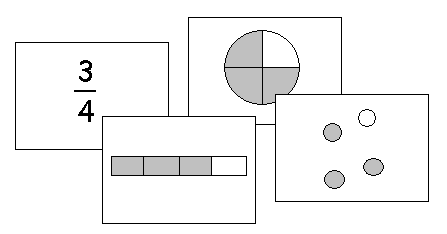 I’ve always wished somebody would put together an animation package which uses these three graphical approaches to explain what it means to multiply fractions by fractions. It’s the one fraction skill where our experience/intuition is of no help, and I think a simulation might help students gain a firmer grasp. The most helpful thing I know for multiplying fractions is to think of the multiplication symbol as meaning “of.” That way, you are trying to find a fraction of a fraction — a part of a part of the whole thing. When I think that way, it is easier for me to visualize it. The topic of multiplication is coming up near the end of this fraction series. As slowly as I’m going through the posts, that may be after the New Year. for an in-depth look at the mathematics of fractions and how to teach them to kids in grades 4 and up. The bottom line is that, whereas parts of a whole and so on are helpful ways to think about fractions, to really understand them you need to understand them as points, on a number line, that are built up by subdividing the unit internal. The four arithemtical operations are then understood concretely in terms of how you construct the fractions.